It was Sondheim’s birthday, but the night belonged to Sweeney and Stritch. Sondheim! The Birthday Concert is a thoroughly entertaining and pleasant two hours of music. 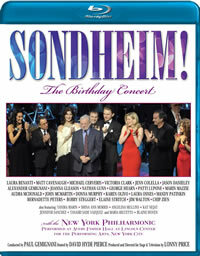 This is a high-society production recorded at Lincoln Center’s Avery Fisher Hall on March 15-16, 2010, to celebrate Sondheim’s 80th birthday. The setlist of 24 songs fairly well covers the highlights of Sondheim’s career; 12 shows are represented (including Sondheim’s score for Warren Beatty’s movie Reds, set to a pas de deux). It’s heavy on Follies, though, which checks in with seven songs, while Sweeney Todd and Sunday in the Park with George each have three songs. Throw in two each from West Side Story and Merrily We Roll Along and that leaves one song each from eight other shows, including A Little Night Music and Into the Woods. Rather surprisingly, Gypsy didn’t make the cut. It’s all about the music, since everybody’s buttoned down in glamorous gowns and tuxedoes. Aside from West Side Story’s Latin-flavored outfits and the Reds ballet, there are no costumes to speak of and precious few props. The only proper props, in fact, are a couple suitcases during the ballet and Sweeney’s switchblade. But that’s fine. The music, the lyrics, and the performances are what matter and they’re top-notch across the board. The evening’s host, David Hyde Pierce (yes, from TV’s Frasier, but also a Broadway staple), co-wrote the show with director Lonny Price and they keep things moving briskly. A couple good running jokes help give the show its own personality and alleviate review show fatigue. One’s about Sweeney Todd (“We’re here to eat cake, not people,” Pierce quips) and the other’s about Pierce’s scheme to have all the songs performed in foreign languages in order to represent the global appeal of Sondheim’s work. It’s a notion which calls to mind the multi-lingual performances of Do You Hear the People Sing? and One Day More at the 10th anniversary concert of Les Miserables. That linguistic joke culminates in Pierce’s terrific, seamless international take on Beautiful Girls. The performers are a nice blend of original cast members and fresh faces like Laura Osnes, Jenn Colella, and Bobby Steggert. Among the veterans is Bernadette Peters, who has apparently sold her soul to the devil. That’s the only rational explanation for how great she looks; she simply doesn’t age. She’s still damn hot. Hot damn! Peters performs alongside her Sunday in the Park with George co-star, Mandy Patinkin, then accompanies a cadre of red-dressed ladies, namely Patti LuPone, Audra McDonald, Marin Mazzie, Donna Murphy, and 84-year-old Elaine Stritch, who still manages to make I’m Still Here a showstopper. Particularly exciting is the handling of Sweeney Todd. George Hearn, Broadway’s second Sweeney, and Michael Cerveris, Broadway’s most recent demon barber, accompany Patti LuPone, who performed with both Todds during their respective productions, for a tasty take on A Little Priest. And Todd’s infamous switchblade figures sharply in the two Todds’ duet of Pretty Women. Cerveris exudes a rare cool factor and it’s most definitely on display here. From song to song, what’s interesting to watch is how deeply moved the performers are by the words and the music. This is the kind of emotion that transcends mere rote performance, it’s the kind that indicates the performers are deeply connected with the material. Sondheim’s shows have clearly had an impact on the artists. Take a look at John McMartin’s rendition of The Road You Didn’t Take, Peters singing Not a Day Goes By, and Stritch belting out I’m Still Here. Those performances alone make this birthday a keeper. We’re Gonna Be All Right, Do I Hear a Waltz? Aside from some fairly enlightening, but breezy, liner notes by director Lonny Price, there are no supplemental features whatsoever. That’s a shame because there are a whole bunch of obvious possibilities for extra materials to make this a better package and value. An index of Sondheim’s productions and trivia like opening dates and theatres would’ve been nice. Of course, a little biographical information would’ve been a no-brainer given better hands. A documentary? How about some retrospective comments from Sondheim himself? Or interviews with all those wonderful performers recalling their experiences with Sondheim? Or a handy setlist that includes the performers on each song? Granted, that information was intentionally left out of the evenings’ programs in order to create an element of surprise for the attendees, but it’d serve as a nice convenience and reference point here. There’s nothing here. Even the menu system is totally unimaginative. What’s worse is it looks like it was designed on a Commodore 64. The picture quality is acceptable, which is to say it is mostly excellent, but for a show recorded in high-definition, it lacks a certain high-def pop. No doubt it’s primarily a limitation of the staging and the lighting within the confines of Avery Fisher Hall. Even so, it’s particularly irritating to see loads of digital noise on shots of Sondheim sitting several rows back in the orchestra seats. While the video faulters on occasion, the audio delivers. There are two options: DTS-HD Master Audio 5.1 and uncompressed PCM Stereo.